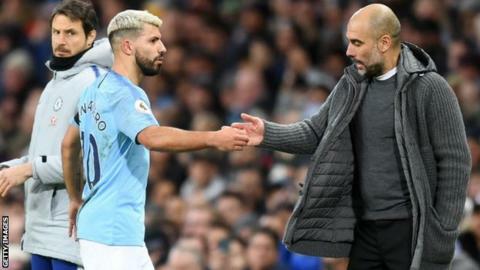 Manchester City manager Pep Guardiola praised his “outstanding” players after the Premier League champions recorded a third league victory in eight days. Sunday’s 6-0 thrashing of Chelsea followed a midweek win at Everton which had seen Guardiola’s side go top for the first time since 15 December. Their winning run began against Arsenal last weekend, but was preceded by a shock defeat by Newcastle. “I just said to them thank you for what they have done,” said Guardiola. “After Newcastle, we spoke to each other and put ourselves in front of a mirror and accepted the reality. After that we worked, moved forward. “After three games in a week – tough games against Arsenal and at Goodison Park – playing the way we played with this intensity and patience to find spaces in the right moments, the players were outstanding. Among City’s six goals against Chelsea at Etihad Stadium, Sergio Aguero registered a second hat-trick in three games to make it nine goals in his last six matches in all competitions. It was a landmark day for the Argentine, who in scoring his 15th City treble equalled Alan Shearer’s Premier League record of 11 hat-tricks and became the club’s record league goalscorer with 160. “I have said many times, Sergio scores every single season a lot of goals,” said Guardiola. “I admire these kind of players, the consistency. Young players come but some stay for a long time – that is fantastic. Guardiola’s side now have three cup fixtures before returning to league action, with Newport County up first in the FA Cup fifth round on Saturday. A Champions League round of 16 first-leg tie at Schalke follows on 20 February, before City meet Chelsea once more in the Carabao Cup final on 24 February. During that period, Liverpool have the opportunity to move three points clear in the title race when they travel to face a resurgent Manchester United. “[We are] top of the league, but we have to wait to see when Liverpool go to Old Trafford as we have played one more game,” added Guardiola. “They win that and they are leaders, with us behind, but I am proud. “What we did last season, to still be there every single game, that means a lot to me. So for 11 games, we are going to try until the end to retain the title. “The final of Carabao Cup, now it’s tougher as they [Chelsea] will react.